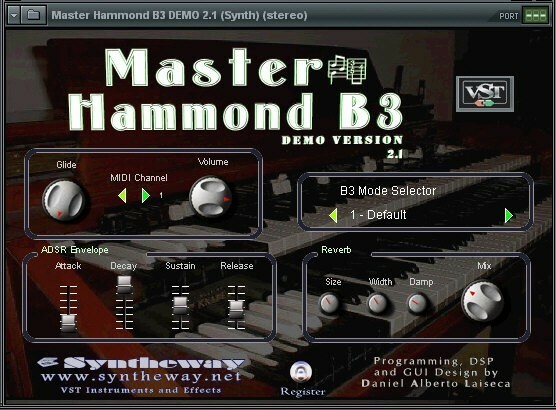 MASTER HAMMOND B3 is a Virtual Hammond VST plug-in with a rich and authentic sound based on the legendary B3. The result is a warm and powerful sound over the entire range of the keyboard. The MHB3 is capable of all the variations one expects from this type of organ, and is suitable for any flavor of music, be it Rock, Jazz, Blues, Gospel, etc. - Authentic sound based on an intelligent VSTi engine and Sample Playback, which provides virtually unlimited dynamic expression for your performances. - Modeled on mastered samples (normalized and noise-reduced). Based on PCM recordings of a Hammond B3 organ with full length sustain samples, no loops (natural decay), stored in 16 bits and 44.100 KHz. - ADSR envelope generator with Attack, Sustain, Decay and Release parameters and several modulation targets. - 10 Acoustic Ambience presets. - Portamento/Glide control: affects pitch transitions. A gliding effect that allows a sound to change pitch at a gradual rate, rather than abruptly, when a new key is pressed or MIDI note sent. - Reverb built-in: free variation of acoustic ambience thanks to complete separation of organ and room. Small rooms can be modeled just as accurately as larger spaces. - MIDI Automation: Added complete MIDI CC#.